I’ve been racing the Old Ghost Ultra since its inception back in 2016 (see my previous race reports, 2016, 2017, 2018). The Old Ghost is my favourite run bar none. From a purely scenic and terrain perspective, it abounds. 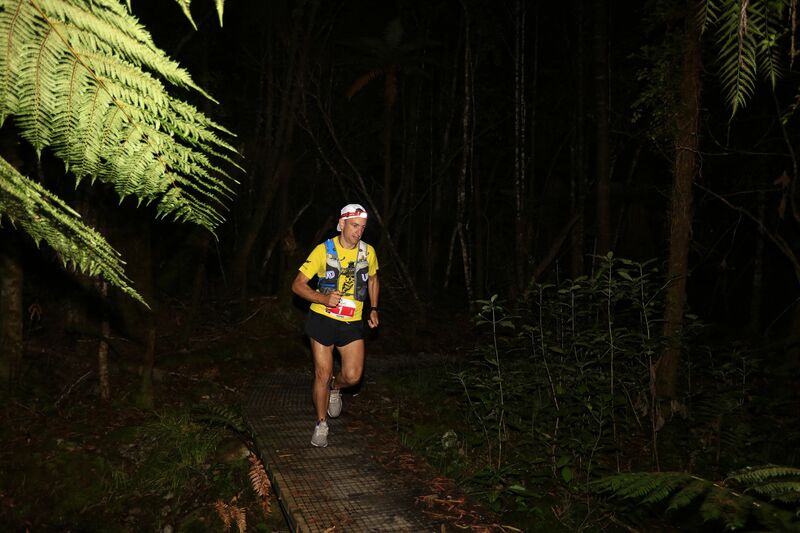 Racers start off from Seddonville in the dark and slowly make their way along the Mokihinui River. As the sun gently rises they’re treated to some incredible views of bush-clad gorges. After some lovely forest running, the track heads up and competitors navigate the infamous Skyline Steps and a series of switchbacks to Ghost Lake. From there one enjoys some incredible rocky ridge running to the high point of the course at Heaven’s Door before heading back down through the forest to Lyell. 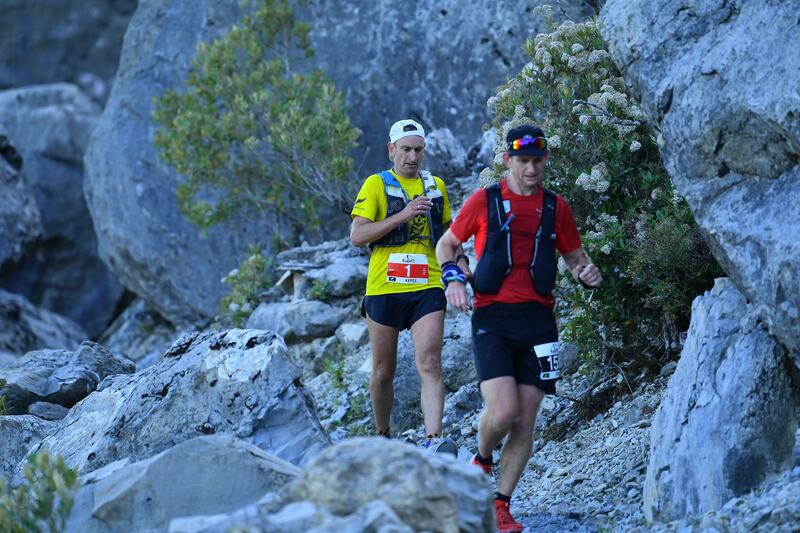 At 85kms and with just shy of 3,000 meters of vertical gain, the race isn’t the toughest one out there, but it has a few unique aspects that make it harder than one would imagine. Firstly, it’s pretty isolated. Unless you’re carrying an inflatable helicopter in your race vest, your only option is to continue forward or turn around – both of which mean more time on your feet. The race is also tricky since the alpine sections are both high and exposed – meaning the chances of weather impact are huge. And finally, much of the track surface is broken rock which means that by the end of the race, pretty much everyone is more footsore than they should be after 85km. So, yes, the Old Ghost ultra is an incredible race when one looks at the terrain and location aspects in isolation. But what makes it truly unique, and something that so many people commented upon at the weekend, is the spirit that everyone who touches the race is caught up in. You see the Old Ghost Road was simply an idea on a map less than a decade ago. A century or so ago some miners had envisaged a track running between Seddonville and Lyell and had even built some of it at the Lyell end, but faced with seemingly insurmountable barriers, they gave up the fight and the trail was left to be reclaimed by nature. Fast forward a century or so and a few good keen West Coast locals found a map of the proposed route and decided to investigate finally making that map a reality on the ground. Long (very long) story short, after incredible amounts of work, countless funding applications and a huge amount of blood, sweat and tears, the Mokihinui Lyell Backcountry Trust, under the incredible leadership of its chair, Phil Rossiter, completed building the track and The Old Ghost Road was complete. Not being one to rest on his laurels, Rossiter decided that the perfect thing to celebrate the opening of the track and to encourage its continued use was organizing a trail running event from one end of the track to the other. And so the Old Ghost Ultra was born and in 2016, 60 hardy souls toed the line at Seddonville to challenge the course. Every year since the event has been held and every year it has gotten more popular to the point that this year 300 entrants, the maximum number allowed by the race permit, were at the race briefing in Westport. 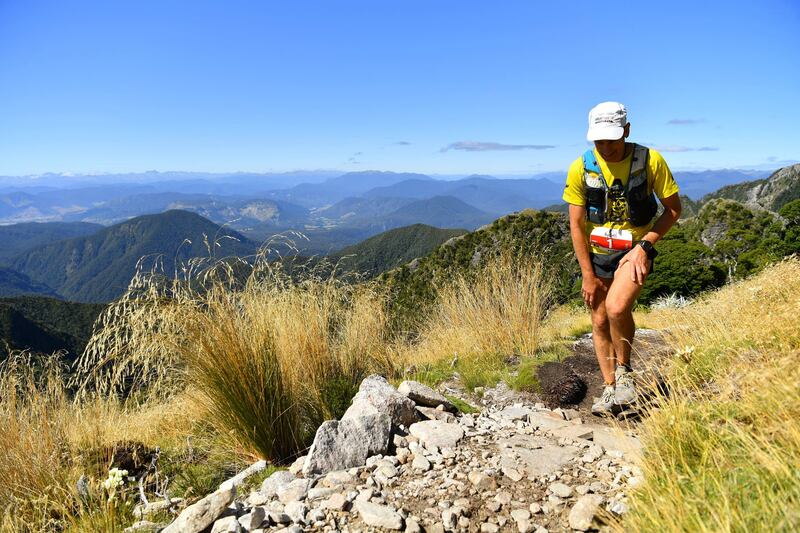 And of those 300 competitors, a third had travelled from outside New Zealand – this race is quickly becoming one with huge international recognition. Last year I achieved a time that I honestly believed was as fast as I was capable of. Going into the 2019 race, however, I figured that my only option to make up some time was to take the risky approach of going all out from the start. 85kms is a long way and that’s plenty of distance to suffer from the effects of too fast of a start, but time lost in the first half simple can’t be made up later on. I was also mindful that this year I had a bunch of friends racing the event. Apart from all the usual suspects, the entire Hagley Hombres running squad, other than Yonni, were at the race. In particular, I figured that Kevin Grimwood, with his combination of fast leg speed and knowledge from having run the Ghost the year before, would be a threat. Similarly, Lee Butts, while not having run 85kms before, has far higher leg speed than me and would be able to carve me up if we were together in the last 25kms. 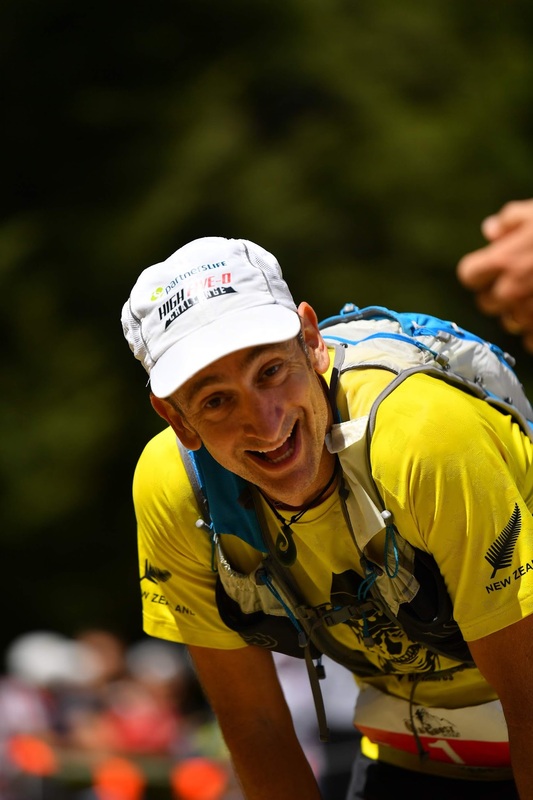 The fourth Hombres, Andy Higginson, has been a running mate ever since my first ever ultra during which he spent a leisurely hour or so throwing up and sleeping in the middle of a big climb. I was almost tempted to run with him just to try and get another sight of him having an epic nutritional battle but competitiveness got the better of me. The first 20kms, in particular, is narrow and so getting caught up behind lots of runners can make a big dent in your total time. Also the first 45kms or so is pretty much entirely runnable and so, while risky, trying for a fast first half can pay dividends. I’d also done some stalking of historical times and Bernard Robinson, another four-time competitor in the race and someone who has always finished in front of me at the end of the day seemed to go out fast and it worked for him. Also, the fact that Bernard looks very much like a Roman God motivated me – maybe if I copy his race approach I’d start to look that cut as well? So from the start, I gave it a nudge and ran far harder than is wise. The first aid station, at around 18kms, clicked by 12 minutes faster than last year and by the Stern Valley aid station, roughly halfway into the race, I was 20 or so minutes up on my previous best. 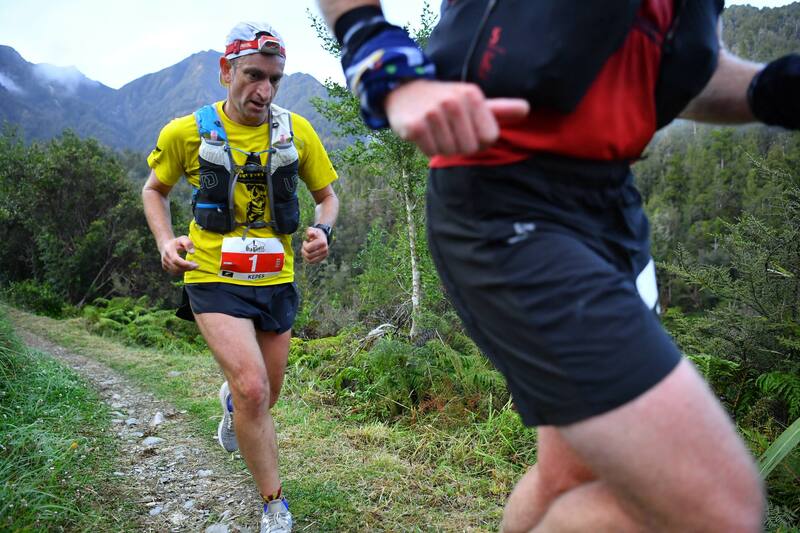 I have to admit I was helped by another past competitor, Simon Neale, who was keeping a great pace in this section – faster than I would have done on my own, but not so fast that I was redlining. Still early on (you can tell since I have my headlamp on) and closely following Simon. Past Stern Valley I heard a runner approaching from behind and saw that Mel Aitken, the defending women’s champion and international representative (on both the road and trail) had caught up to us. I expected Mel to come past but she seemed happy enough to follow behind. I always find myself tiring in the middle section and purposely used the section from the Skyline Steps to Ghost Lake Hut to regroup – I mainly walked this section and ate and drunk a bit to fuel myself for the hours to come. Even the downhills on this section are somewhat technical and any time lost due to walking is probably gained through taking care of nutrition and letting the legs recover from the ascent of the steps. At Ghost Lake aid station I took the chance to fuel up and have a chat with Top Dog Rossiter and Kerry Suter. There was WiFi at the aid stations and the crew were doing an awesome job of streaming interviews and footage across Facebook live. It was awesome to hear encouragement from Yonni, who was watching the race from England, and Viv at home, as well as a bunch of other running mates. The section from Ghost Lake Hut up to Heaven’s Door is quite fun. I tend to fast hike it – it’s pretty rocky and the slight ascent makes running it a bit hard. To be honest in sections like this I don’t think there is much time difference between jogging and fast hiking, and with a few twinges of cramp starting, I wanted to take a bit of extra time to fuel up, take some magnesium tablets and make sure I was in a good state for the flowing downhill that marks the last 25kms of this event. As the track headed down and back into the forest, I opened up the legs and was stoked to be able to run this section at pace – the cramps of previous years, while always threatening, never came on hard. It was also great to spot runners in front and catch and pass them as they suffered from the impacts of their earlier speed. I felt a little bit bad passing Simon Neale after all he’d done to tow me for the first section, but with the potential of picking up a podium spot, I wasn’t feeling charitable. On the last 10kms, I came across a few buddies who were hiking up to spot runners – but didn’t stop and chat since I was in a good space to keep up a good pace. The last five kilometres went on a bit longer than I would have liked, my legs just wanted to get to the end by this stage. Coming around the corner with only a few metres to go I was amped – a quick run across the bridge then up a few steps and the finish line was in sight. The last few meters and I crossed the line in 8:11, just shy of half an hour faster than last year’s time. Best of all I got to stop running, take my shoes off and enjoy a cold beer which quickly dissolved the memory of how hard the last eight hours or so had been. My 13th place, out of 275 runners, isn’t a genuine picture of my running abilities and I was reflecting upon this on the way home. While Bernard Robinson is undoubtedly a classy athlete (and has far more ability than I do) I think he would agree that neither of us should be top 15 candidates for an international field of this calibre. It’s not false modesty but simply a reflection of the truth that in one’s mid to late forties, trying to remain competitive in a fast race with twenty and thirty-year-old athletes is unrealistic. Without wanting to sound too airy-fairy, I truly believe that having been at the Old Ghost since the first event, all of the ten remaining “Originals” get caught up in the spirit of the event and this gives them an edge that they wouldn’t otherwise have. Maybe there are some random Mokihinui spirits that imbue runners with a certain power after spending enough time in their home territory – whatever it is, The Old Ghost has always seen me run outside of myself and able deliver, beyond expectations or reality, on the day. I am, however, realistic and realize that I’m unlikely to continue the trend of ever-decreasing times. But that’s OK. I’ll continue returning to the Coast and racing the Ghost so long as my body allows. And thereafter I reckon I’ll keep going back in order to continue immersing myself in the spirit of the Old Ghost. Oh and if you’re feeling generous, and want to donate to this incredible project, you can do so here.